Few things can be as uncomfortable as being pregnant in the height of a summer heat wave. Why not cool down with a nutritious snack that will satisfy your sweet tooth and be healthy for your baby? Smoothies are a great way to pack fruit, calcium and fiber into one tasty treat that is easy to prepare. To make it even easier, keep bags of frozen fruit that are ready to pop in the blender when you feel a craving coming on for an ice cold, guilt-free indulgence. speed until mixture is smooth. Pour into two cups and enjoy! *If you prefer to use fresh berries instead of frozen, add 10 ice cubes to the mix instead of 5. 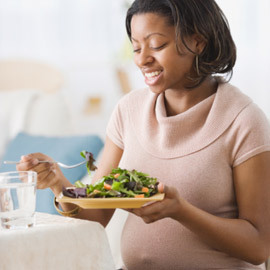 At Health Foundations, we know that nutrition during pregnancy is paramount. Overwhelming scientific and anecdotal evidence shows that excellent maternal nutrition almost always results in healthy moms and healthy babies, while poor nutrition leads to complications. The pressure of busy lifestyles and weight ideals, plus lack of knowledge about nutrition are major obstacles to optimal health for many women—add to these feelings like nausea, fatigue, and other physical stresses of pregnancy and it can be extra challenging to eat right in pregnancy. But by educating yourself about nutrition in pregnancy, taking this time to really honor and nurture your body and your baby, and listening to your intuition; you can achieve excellent nutrition during pregnancy—when its more important than ever.